It's Friday and I'm happy to be hosting Presto Pasta Nights #211. I want to give a big Thank You to Ruth of Once Upon A Feast for giving me this opportunity. I also want to thank everyone that participated; making this a delicious roundup. 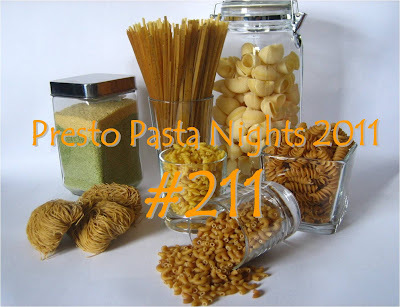 First up we have La Pasta e Fagioli a family recipe submitted by Cafferriera of La Cafferriera Rosa. 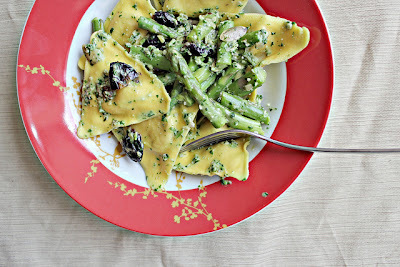 Nont only is this pasta simple to make it's also vegan and dairy free. 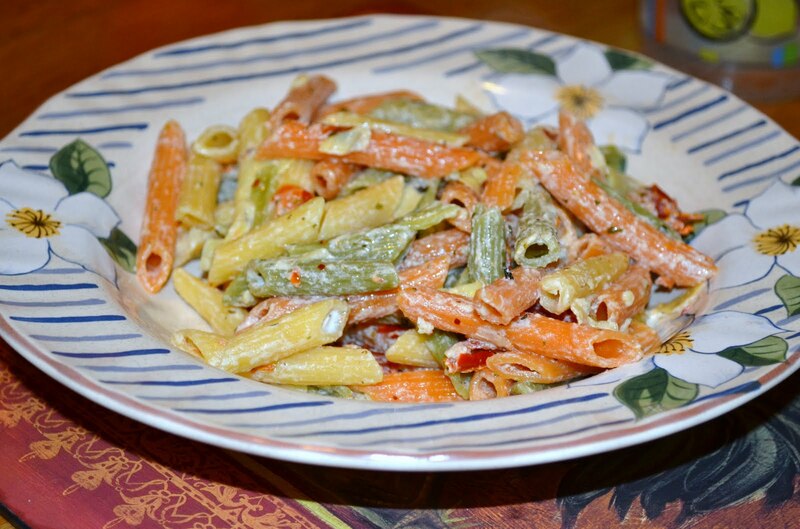 Next we have this colorful Roasted Asparagus and Tomato Penne Salad with Ricotta brought to us by Val of More Than Burnt Toast. 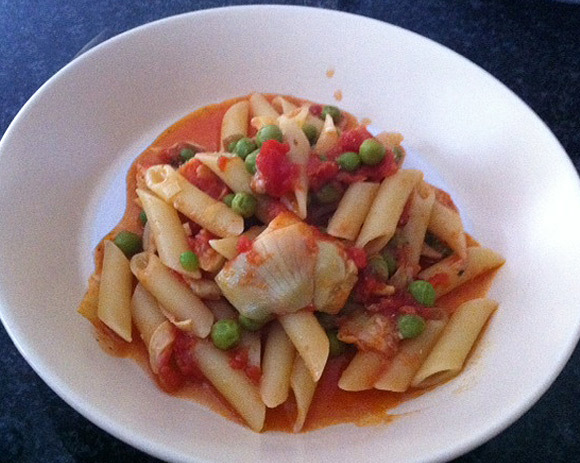 Val showcases some lovely veggies in this meatless pasta dish. Up next; Kristen of From Kristen's Kitchen to Yours shows us what to do with leftover pumpkin puree. She made Pumpkin Gnocchi with Sage Butter. Pumpkin, sage and butter...sounds good to me. 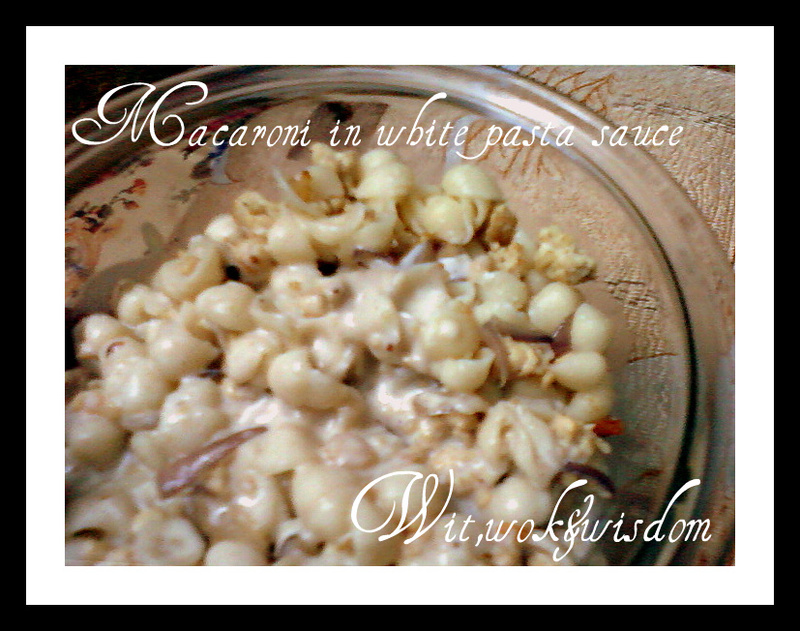 Still somewhat of a newbie to Presto Pasta Nights Wit Wok and Wisdom has shared with us her recipe for Macaroni in White Pasta Sauce. It's rich, creamy and easy to prepare. Next up Joanne from Eats Well With Others shares her "cure for whatever ails you" Ravioli Salad with Black Olives and Pepitas. 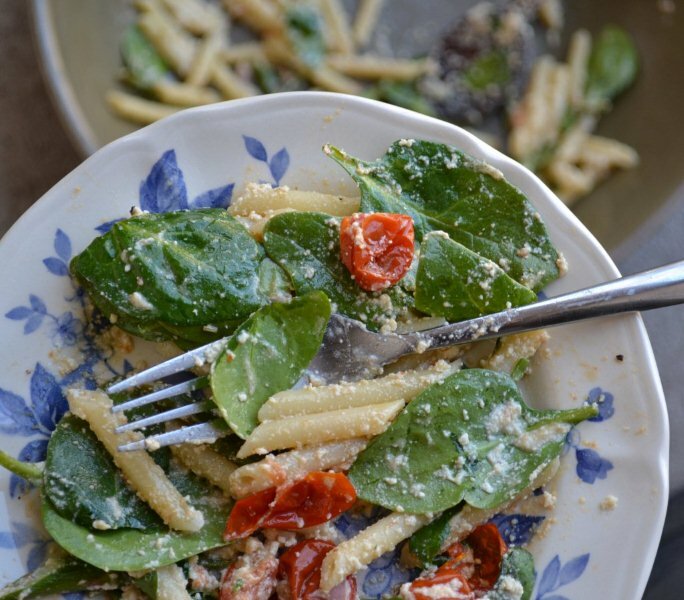 I couldn't agree more with Joanne that "It's enough to make life feel pretty damn good"
Wendy of La Phemme Phoodie submitted Roasted Red Pepper and Goat Cheese Chicken Pasta. 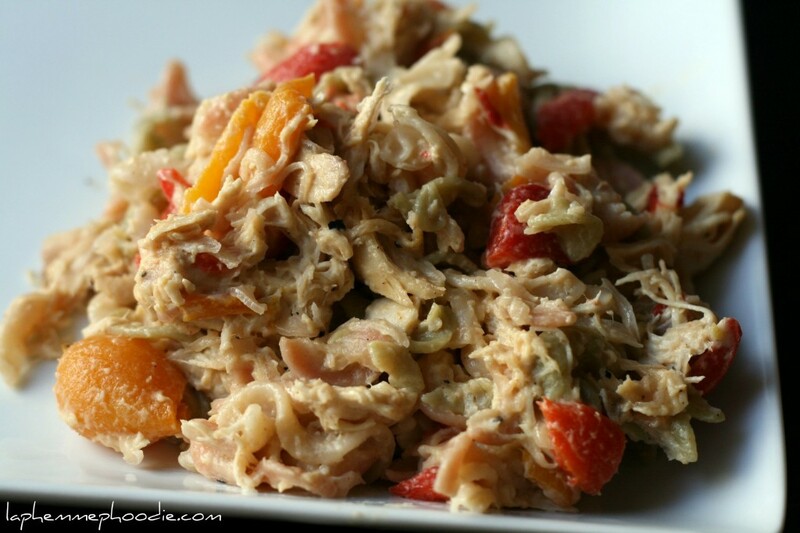 Light and tangy this dish has it all. What's next? 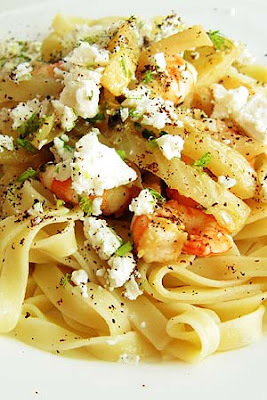 How about Prawn, Fennel and Feta Tagliatelle, submitted by Abby from the blog Eat the Right Stuff. 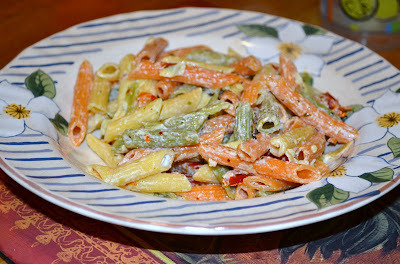 Abby changed up the original recipe to include pasta just so she could share it with our us. Do you ever wonder what they're cooking over in Jersey? Just check out this yummy meatless Penne with Sun Dried Tomatoes, Artichokes and Goat Cheese that Lisa from Jersey Girl Cooks has submitted and you'll know. 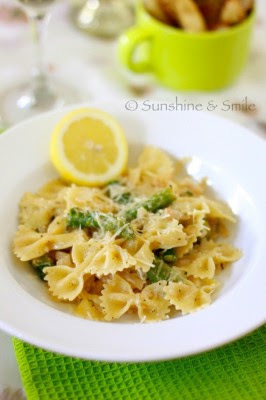 Kankana from Sunshine and Smile introduces us to her Bowtie Pasta with Asparagus...the perfect dish for spring. Last but not least is my submission: Pasta with Peas & Artichokes in a Spicy Tomato Sauce. Well that's it for our pasta this week. I hope you enjoyed this as much as I did. Now go out and cook some pasta. Oh and don't forget to check out next week's round up being hosted by it's creator Ruth of Once Upon A Feast. what a fantastic selection of pasta dishes!! Wow, they all look great. The orzo looks amazing! Love the variety. They all look fab! I want some pasta now. Lovely roundup. Thanks for a great hosting job once again. And thanks everyone for some delicious dishes! I can't wait to give them all a try. My goodness...I would gladly eat every one of these dishes! Everything looks absolutely delicious! Great selections! Thanks for the round up!Amazing array of Pasta dishes you've got here:)Got to try some pretty soon! I wish I had time to make every single one of those!! This sort of looks like pasta heaven. Carbs packed with flavor. Does it get much better? I can't think how. Delicious round-up! Sorry I completely spaced out and forget to send you mine.